Gifts can be a tricky subject. First of all, NO JUDGEMENT. Do Christmas gifts in prayerful consideration of what works for your family. This is a non-essential people. Do not shame others. Our Christmas Present Policy was born after a Christmas when I witnessed my 3 1/2 year old twin boys rip through every present in 2 seconds, then throw it aside and exclaim "What else did I get?!?!" Yes, I know they were only 3 years old, but it is never too early to teach gratitude. For several years, our gift policy was three presents each, since that was how many Jesus received. It was simple for their preschool minds to understand. Before opening a gift, find out who it is from. Thank the giver for buying you a gift, before opening. After opening, thank the giver again for that specific. Use eye contact. I want them to open one gift that makes their heart race on Christmas Morning. It is not a cliche to have your heart race with the gift of Jesus, so why not give our children that experience in a tangible way they can understand? This is where your child's "wish list" comes into play. If you are on a budget, you may need to supervise your child's list making process. I personally don't believe it is good for children , especially elementary and preteen, to be taught that Christmas is an excuse to become irresponsible with the money God has given us. Don't be afraid to share that you using a budget with your children. You can make this kid friendly teaching moment about living within our means. I supervise my kids putting 2 to 3 items on a list. 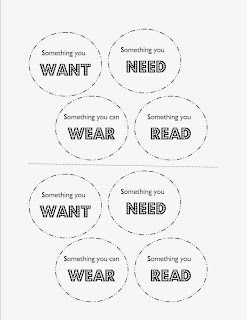 If they are using store ads (we don't get these, but my mother in law always give them these to pick their presents when at her house), then I make sure they are putting items on the list that are in our budget. 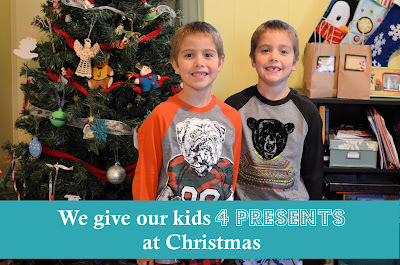 A great story was last year when my 4th grader only wanted ONE thing, but it was $40 over our budget for all his presents combined. I told him he needed to add a few more items to his list, and he added at least 3 more items that were well within our budget. PRAISE THE LORD I found the gift he had originally wanted on Ebay for $20 under budget!!! The memory of his face when he opened it is one of my favorite Mommy moments ever!!!! This is the practical, but still fun, gift. It can be anything from a new comforter for their bed, a new bookbag for school, or even a a keyboard for piano lessons. It can also be as simple as new socks and undies. I do recommended if you go the undies or socks route, splurge and get the "cool" character ones. It is Christmas after all! Pretty self explanatory. I like using this category to support a small business if possible, by ordering handmade hats from a local mom. Again, kind of self explanatory. We kept it inexpensive when the boys were preschoolers by stocking up on books from the local library sale. If your kids are into series, you can add to their collections through this gift. Since are the stereotypical homeschool family, I tend toward educational books. We have been been adding to their Imagination Station book series for the past 2 years. Now they are getting a little older, we are also planning on buying them more of the I Survived Collection . If you would like a spiritual gift, buy a devotional or prayer journal. We really enjoyed My Big Book of 5-minute Devotions when my boys were in Preschool-2nd grade. If you have a boy in your life, I highly highly recommend The Action Bible . My in-laws bought these for my boys when they were baptized, and they literally spend hours reading them. To download Free Christmas Tag Printable, click here. Thank you for using Affiliate Links. They help me keep the blog open, at no extra cost to you.